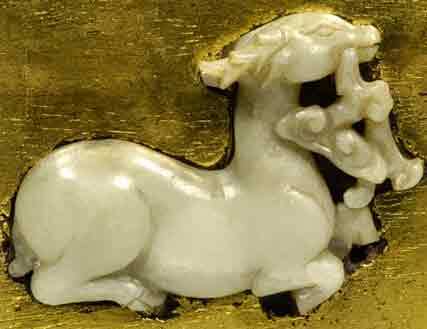 Objects in ivory, bronze and other metals. 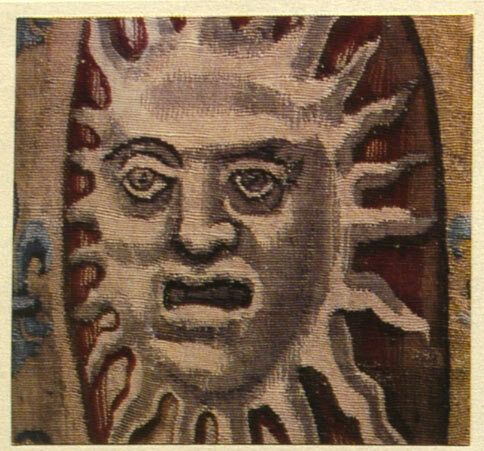 Carpets and tapestries. 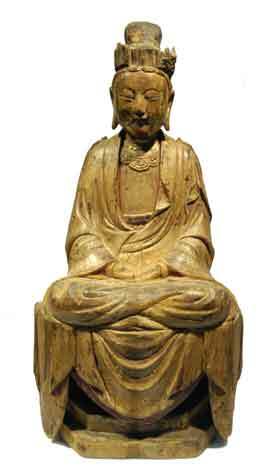 Chinese and Buddhist art. 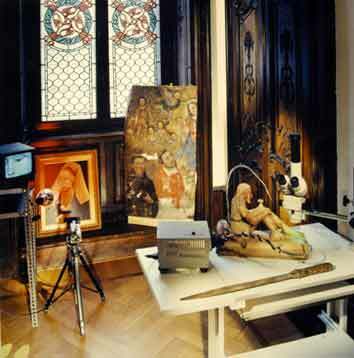 The Museum's scientific laboratory and scientific methods. 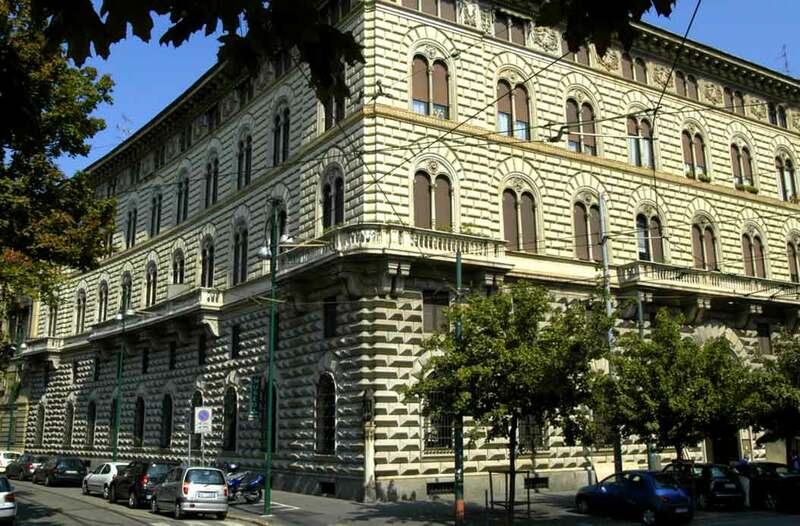 The prime institution for the fight against forgery and imitations is the Guardia di Finanza or Financial Police. 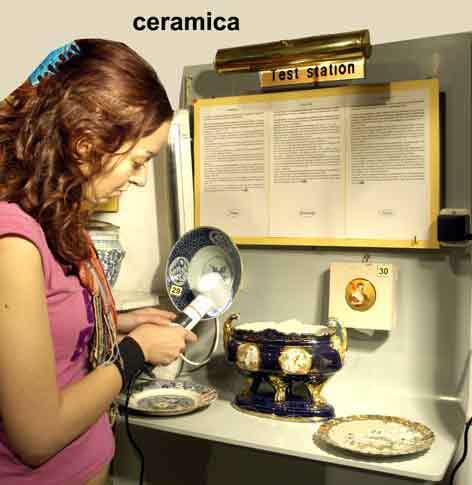 The most recent catalogue on the determination of authenticity in art, published by the same in June 2007, contains an exclusive six-page presentation of the scientific laboratory of the Museo d�Arte e Scienza in which its methods for dating paintings, furniture, and objects in ivory and other materials are illustrated in detail and their validity, in effect, endorsed. Art lovers and investors. Copies and fakes will continue to be offered as originals as long as buyers of art refuse to follow the same line of conduct adopted when acquiring other �products�, that is to say insisting on a dependable guarantee of the object�s authenticity as the condition for its purchase. It is senseless to content oneself with the personal opinions of experts alone in this age of technology and science. The art market will become trustworthy only when the art lover becomes a connoisseur and, as envisaged by the law, demands a valid certificate. The judgement of a renowned expert or a famous auction house has, at times, the magic power to push an article�s market value up by as much as a thousandfold. 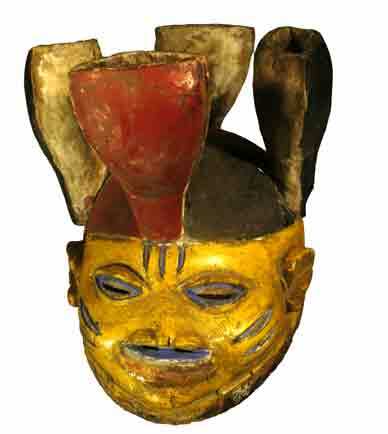 Thus a fine piece of furniture, a painting or an African mask may just as easily cost �1,000 or �1,000,000. This disconcerting difference in value estimates is becoming increasingly common in the international market. This would be conceivable if the appraisal were based on meaningful and verifiable data. Unfortunately this is not always the case. Over the centuries, well-to-do families and museums the world over have accumulated an unimaginable quantity of precious art treasures of incalculable commercial and art historical value. It is widely held, however, that over half of these works are not authentic. In the absence of scientific methods, such conclusions have been based mainly on opinions. On the other hand, with the Internet and other media invading the homes of collectors and investors worldwide, it is inevitable that false assertions regarding technical methods for determining authenticity are revealed for what they are. By discrediting scientific analysis, the art market certainly also harms itself. As a result, buyers and investors are increasingly inclined to make their purchases from large and relatively reliable auction houses. This is the tendency in all sectors and small dealers are forced to close down. But it is precisely the art sector which could escape this trend. A valid method - IR Spectroscopy - the most widely used analytical method in the chemical industry and in scientific research laboratories, has existed for decades. At the outset of his career, every good painter copied the great masters of the past. 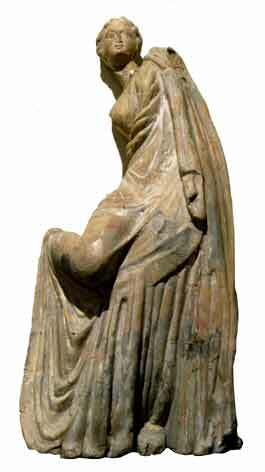 Since ancient times honest copies have served young artists for study purposes and without such copies our knowledge of past cultures would be incomplete. The fundamental fact, which will increasingly characterize the antiques market in the future, is that the demand for authentic items already far exceeds the supply. This should not, as unfortunately happens, lead to an increase in the production of fakes, but rather to the revaluation of good copies. 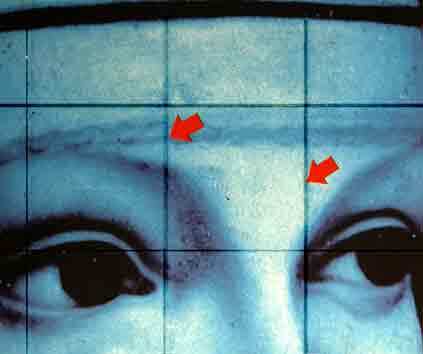 In addition to this problem, moreover, there is an overrating of the painter's signature as proof of authenticity. In the market context, especially in the last few decades, there has been a tendency to consider the signature even more important than the quality of the work. The sole presence of the signature cannot be considered sufficient proof to ensure the originality of the painting. The problem of the signature must be set in the broader context of the attribution of a work. In fact, most painters who made a name for themselves had a workshop in which their pupils and professional painters produced copies of the master's originals, which were then put on the market as his works. 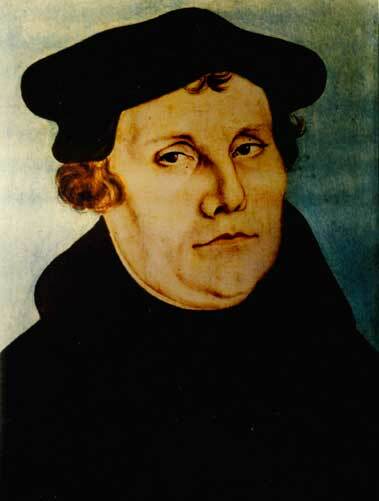 It is said, for example, that Lucas Cranach had up to one thousand portraits of Martin Luther painted. The few specimens which have survived are considered authentic. 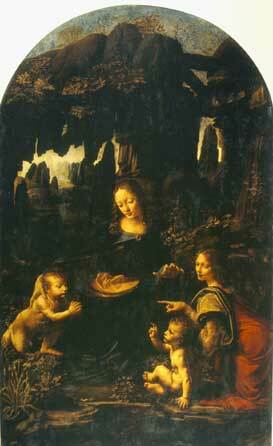 The most convincing demonstration of how problematic the attribution of a work can be is offered by Leonardo Da Vinci with his masterpiece: �Virgin of the Rocks�, of which there are four versions. 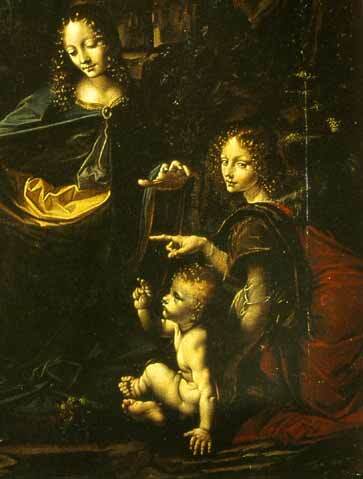 It is believed that the first and second paintings (those currently in the Louvre in Paris and in London's National Gallery) were executed for the most part by the master's own hand, whilst the third (private collection - Switzerland) was painted with more than the usual contribution from his pupils.The fourth painting (National Museum of Art - Copenhagen), attributed to an unknown artist, probably a northern European painter is, instead, surprising. 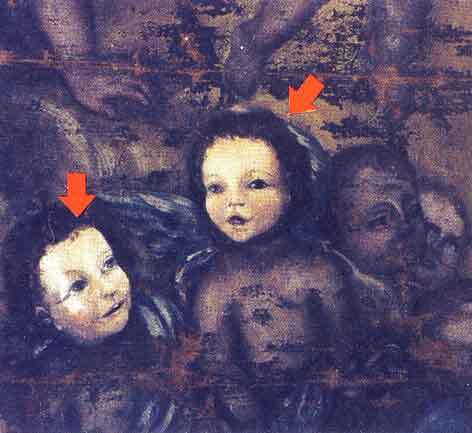 The quality of execution is very similar to that of the other paintings, as can be seen from the details. This observation goes to show that many artists can reach the same technical quality as the great masters, a fact which increases the uncertainty of attribution. A small percentage of the antique paintings on the market is authentic: this means that a painting was executed by the same artist who signed the work. 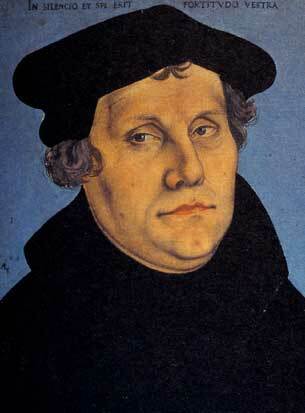 A great deal are copies, made in good faith by pupils and admirers of the master. These become fakes if offered as authentic. Furthermore, there are a great deal of paintings executed with the intention to deceive, where the faker has copied masterpieces and signed them with the signature of another artist. A painting is a very complex object, however, and contains different materials with significant characteristics, each of which offers the possibility of performing scientific tests and art historical analyses based on the experience of generations of experts. All these approaches for ascertaining authenticity are presented on our sites www.MuseoArteScienza.com and www.PaintingsAuthenticity.com and in Volume 1 of our Museum�s handbook (pp.15-64). The label "inauthentic" is given to outright fakes, made with the intent to deceive for illicit monetary gain, but also to works originating as honest copies which, after various changes of hands, have ended up by being sold as genuine originals. Most inauthentic art works fall into this category. 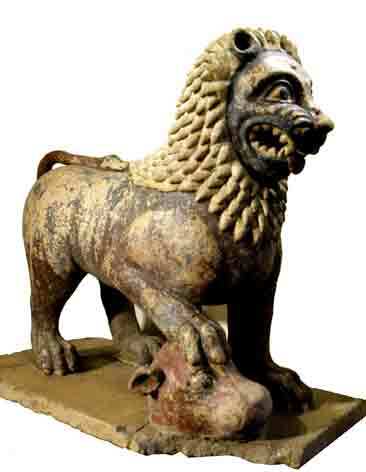 Such a high percentage of inauthentic antiques on the market is easy to explain. 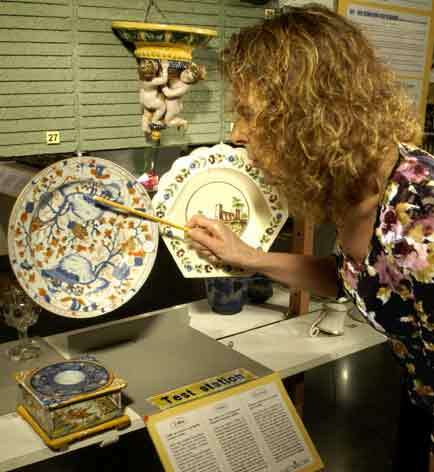 Genuine items from past centuries are not growing in number but becoming increasingly scarce. The number of potential buyers, instead, is on the rise, thanks both to the spread of wealth all over the world and to the increase in per capita living space. The desire to adorn one's home with art objects is perfectly understandable and copies thus become a social necessity. It would be better to re-evaluate good copies rather than boost the production of fakes. Unfortunately, however, antique copies are destined to run out, so that to satisfy the demand it will be necessary to find a valid alternative source. This could be offered by talented contemporary painters, as long as they follow the teachings of the greatest and most ingenious artist and scientist of all times: Leonardo da Vinci. 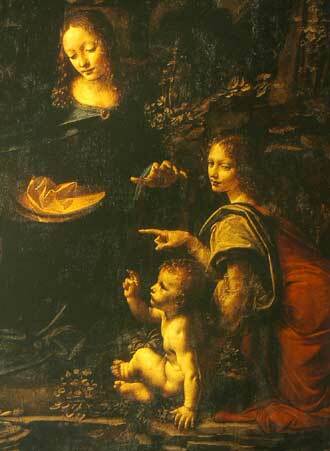 This principle was also followed by all the artists from the beginnings of human culture until the 19th century, only it had never been stated so explicitly as in Leonardo�s �Treatise on Painting�. Much of the blame for this unpleasant situation lies with the buyers themselves and it would be desirable for lovers of antiques to acquire greater competence or at least a good basic knowledge of this complex field. We must bear in mind, however, that this is a difficult enterprise for the following reasons: an antique object can have been made out of an infinite number of materials like stone, wood, ceramic, glass, metal and, in greater detail, glues, varnishes, nails and fabrics. Apart from the materials, a competent buyer must therefore also be familiar with processing techniques and the periods to which they refer. Fundamentally one runs a far greater risk buying a work of art than making any other kind of purchase. When we buy an electric household appliance we can make a fair estimate of its sales price, based on the cost of its raw materials, workmanship, packaging, transportation etc. In the field of art and antiques, on the other hand, there is no logical link between price and intrinsic worth. If we buy an old engraving, for example, any attempt to calculate its value is vain. An old print consists of a piece of paper and a printing operation using a plate or block. There is a huge distance between its low production cost and its imponderable commercial value. In reality, lovers of antique art must not delude themselves into thinking that a knowledge of objective factors represents a guarantee that they can recognize a fine art object. In order to choose the ideal item, in addition to the rules for identifying and excluding objects of scant value, one must have passion, intuition, sensitivity and constant and intensive contacts with the world of antiques. Completely authentic furniture older than 150-200 years does not exist. In most cases, a piece of furniture was an object used in daily life, like a table, a chair or a linen chest, and as such required repairs and restoration as the years went by and, sometimes, a number of modifications to adapt it to new needs. A prospective buyer should therefore observe a piece of furniture closely before making his purchase. 1 - style: the subject is amply treated in a great many specialist books. 2 - the documented history of the piece. 3 - the manufacturing method: for items from up until the 18th century there is no sense in asking oneself whether a piece of furniture was made by hand or industrially. There were no other tools available to an artist or a craftsman apart from his hands and manual tools. 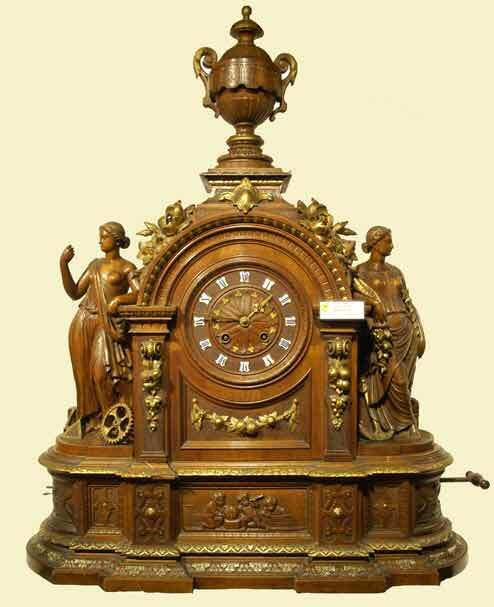 As mechanization and automation progressed, the question of workmanship gained importance to the point that in the last few decades it has come to be considered the number one criterion for judging the authenticity of antiques. In most cases it is sufficient to be able to distinguish handcrafting from mechanical manufacture in order to establish with a high degree of certainty whether an item is antique or recently made. 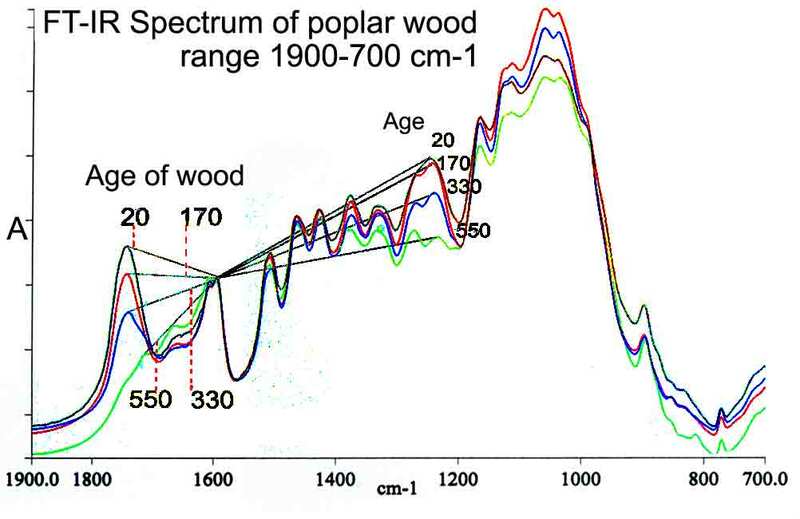 4- scientific examination: the test which offers an accurate dating of a piece of furniture is molecular spectrography, which determines the age of the woods used for its construction. This crucial and decisive test can be supplemented by an analysis of materials and techniques used. 5- the certificate of authenticity issued by the seller. The subject of the authenticity of furniture is dealt with under the section on scientific methods in this site and, in detail, providing numerous examples, explanations and photos, on our sites www.MobiliAntichiAutenticita.com and www.MuseoArteScienza.com and in Volume 1 of our Museum�s handbook (pp. 139-208). The term �ivory� comprises today not only elephant tusks, but also the tusks and horns of other animals and some types of bone. What distinguishes all types of ivory is their hardness and durability, characteristics due to their chemical composition. 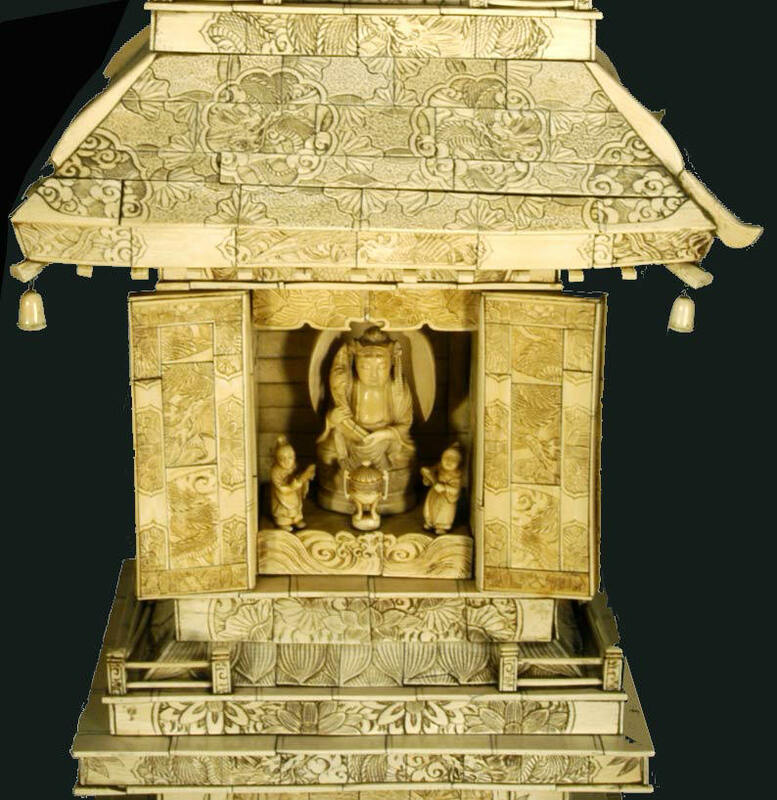 A) The ivory object is sent to the laboratory of the Museum in Milan. This procedure allows the sample to be taken with the minimum and invisible damage. B) The ivory sample is taken by the owner of the object. For dating we need a minimal fragment of ivory (10 mm3 volume - mm 3x3x1) which can be taken from the edge or a corner of the object with a very sharp knife or a small coping saw. The obtained fragment must be put into a piece of paper, which is to be folded carefully and mailed directly to the Museum laboratory. Price for one measurement: Euro 95, $125. 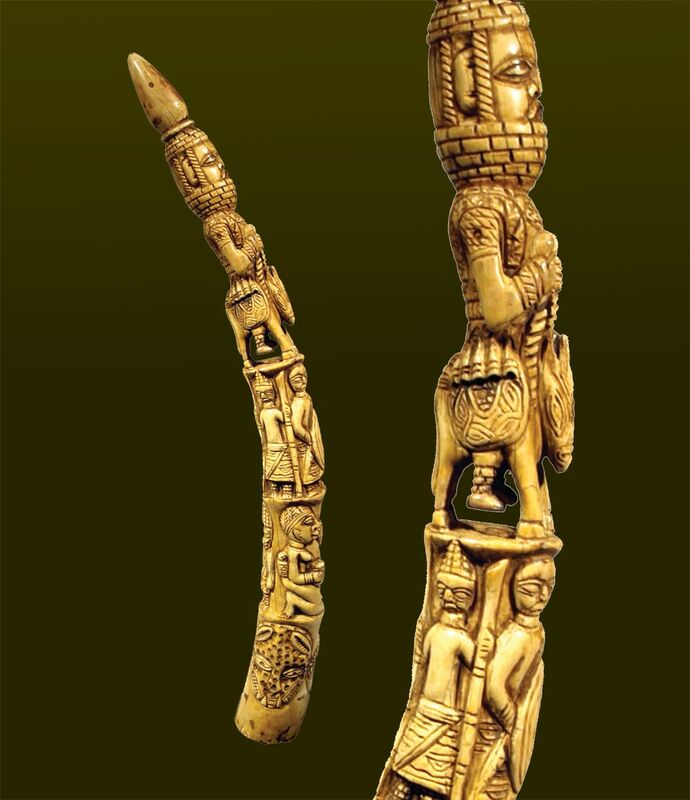 objects in ivory, stone and bronze. The first art objects created by man in every culture were carved or incised in the materials offered by nature: stone or the horns, teeth or bones of animals. Metals had yet to be purified and melted. Ascertaining the authenticity of these antique items is not difficult. They were found buried in the earth and therefore show marked signs of corrosion. Physical, optical and chemical tests cannot ensure the acquisition of sufficient elements for an exact dating, because the objects are made from a single and very often not datable type of material. 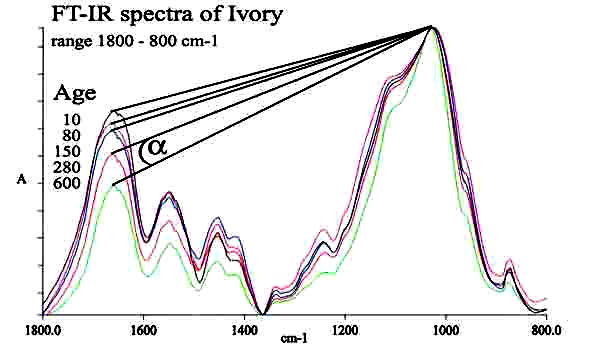 The only exception, since 2007, is all types of ivory: due to the presence of organic substances these materials can in fact be dated by spectroscopy (see first two pages of this website). 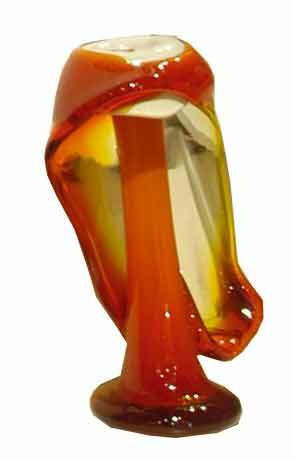 - any object can be shaped completely free-form from molten glass, without the help of a mould. 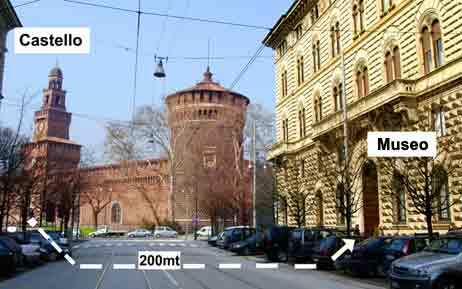 This is possible thanks to a further property unique to glass: glass is defined in physics as a dense fluid. If reheated, glass becomes liquid again. Thanks to this property, a craftsman can complete his work without time limits and without the material deteriorating. Glass does not develop a patina and is not affected by climatic factors. There are therefore no scientific tests which can determine the age of glass objects. An analysis of their authenticity must consequently be based solely on secondary characteristics an understanding of which is the fruit of experience accumulated by experts over the centuries. 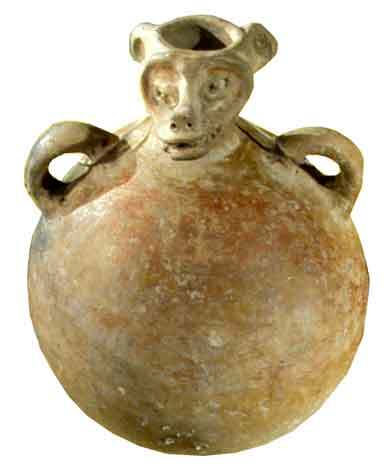 Along with clothes and weapons, ceramic receptacles are the objects most essential to the survival of every population. 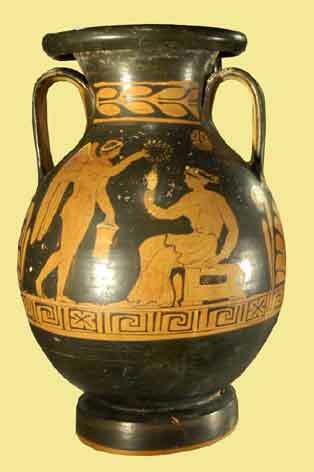 Pottery was used to contain liquids and food, as well as for cooking. Consequently all countries in possession of clay quarries had their own production. Most of these countries limited their own production to the most common shapes for everyday use. It is not possible to say when copying began. It is logical to assume that an artist who saw a work of art he liked of any era would try to copy it. 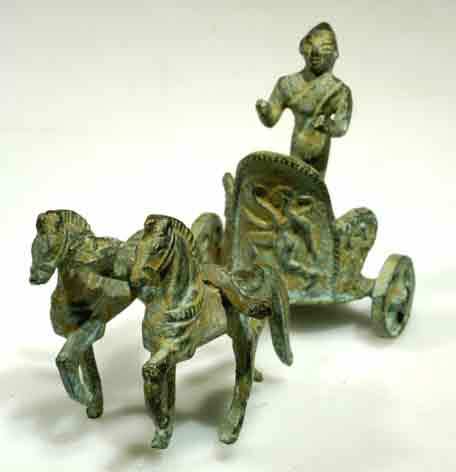 Greek and, above all, Roman sculptors and potters already had a great deal of Egyptian and Middle Eastern models at their disposal. We know for certain that Renaissance and Neoclassicist copyists aged a good part of their works artificially. The skill and industriousness of fakers already at the beginning of the 19th century is well documented by the book �Hellenistische Tonfiguren und Nachsch�pfungen� (Hellenistic Terracotta Figures and Imitations) published by the Berlin State Museum, which acquired an inordinate number of fake terracotta artefacts in the years between 1870 and 1896 through apparently honest dealers. Today�s forgers do not have the patience, however, to execute such perfect works. Fake excavated pottery and 19th century copies often give themselves away at first sight because most of these objects are bigger and more beautiful than the originals. 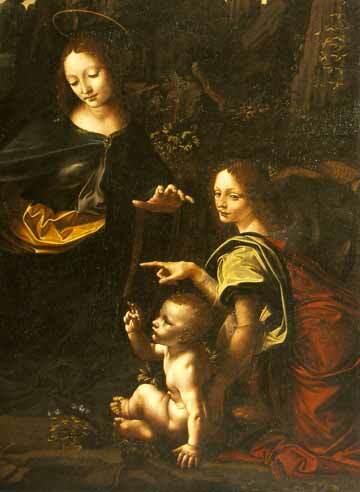 The forger or the copyist is interested in selling, after all, and his work must be as attractive as possible. 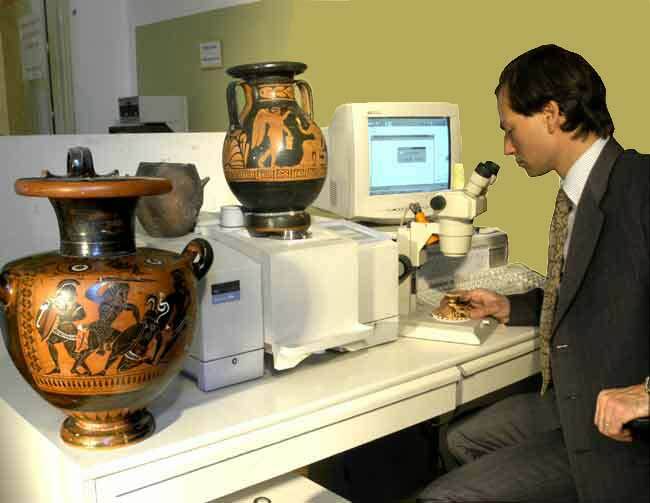 Most of the tests that can be carried out to distinguish archaeological pieces from recent copies are surprisingly simple and accessible to the layman. The humidity in the soil, rich in minerals and plant roots, penetrates the ceramic body. These extensive traces left by the earth offer the surest and simplest means of establishing authenticity. 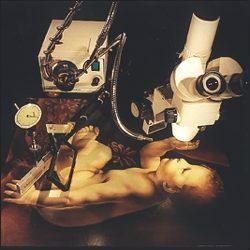 Unequivocal evidence is provided by a spectroscopic analysis of the encrustations, which a well-equipped laboratory can carry out in a few minutes. The approximate age of an object can be determined by the thermoluminescence method. Detailed descriptions of the single techniques and scientific methods are partly available on our site www.ExcavatedArtAuthenticity.com and can be found, illustrated with numerous photos, in thirty pages of Volume 3 of our Museum�s handbook. 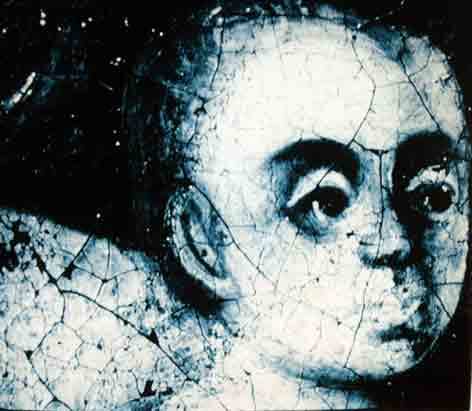 Ascertainment of authenticity in african art. Africa is a gigantic continent extending on either side of the equator, which has given birth to a great many different cultures over the millennia. It was probably the cradle of mankind. Most of the art objects in wood belonging to museums and collectors were however, with rare exceptions, made after the advent of the industrial age; that means after 1850, given that wood rots quickly in a tropical climate. 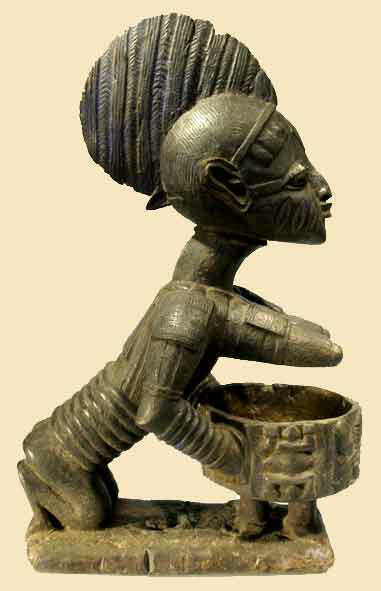 Far-reaching political changes, the opening up of the black continent to mass tourism and the desire of the local populations to make money following the example of the West not only altered old traditions, but stimulated the production of copies of their inherited cultural models for purely commercial reasons. 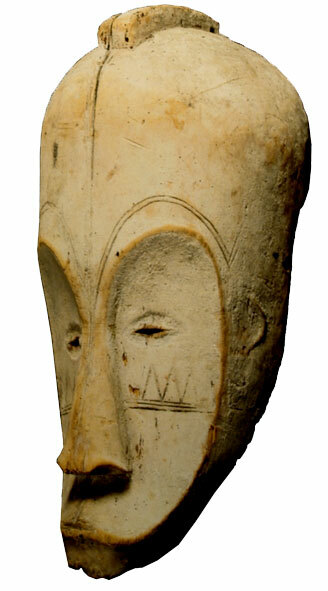 African art produced in the second half of the 20th century has a high probability of not being genuine. Understanding this limitation helps us to distinguish between authentic and inauthentic. 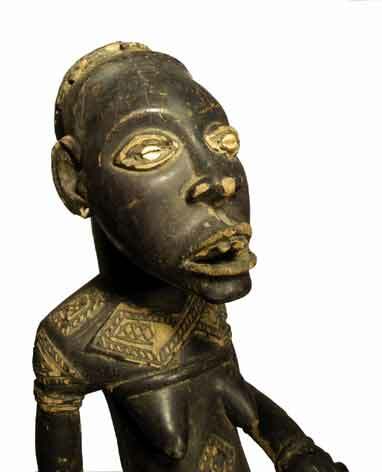 For African art, the best way of determining the age of an object is by dating the wood. Today there is a scientific method serving this purpose which is accessible to anyone interested: spectroscopy. Obviously the fact that a piece of wood is old does not necessarily make it a work of art. But an object which has been dated gives an expert, a collector or a gallery owner the chance to make the most of his or her knowledge of art history and investigate the meaning of the work, setting it in its cultural context. 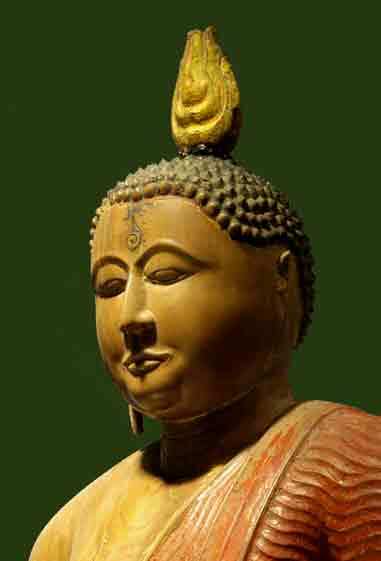 Ascertainment of authenticity in buddhist art. Buddhist art has a very strict iconography. Every gesture and form has a symbolic meaning which leaves little room to the creativity of the sculptor. 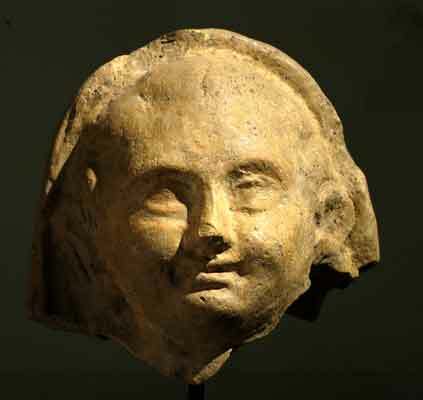 For these reasons it is not easy to classify chronologically objects of Buddhist art. One criterion for judgement is offered by the facial expression, if it has the mystical aura that only an artist who was a believer could give, or the loving and patient execution of details like hands or hair. 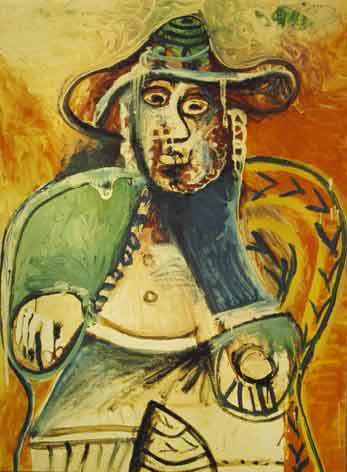 Unbelieving forgers produce lifeless figures with insignificant features and an empty gaze. 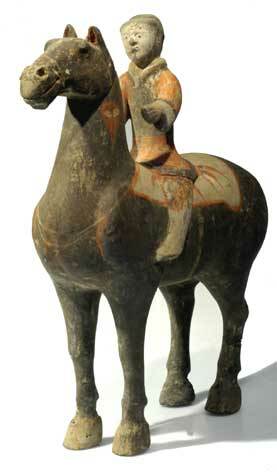 As regards scientific tests carried out on Asian art works in bronze, wood and stone, the same rules and techniques apply as those used for European objects made from the same materials. It must be borne in mind, however, that Asians � and the Chinese in particular � take a different attitude towards copies. For them, copying the masters of the past is considered a virtue and surpassing them an honour. An honest copy is held to be almost on a par with the original and commands a high price on the market, particularly if it has substituted a sacred object in a temple or a monastery. Fakes, instead, are produced for export. 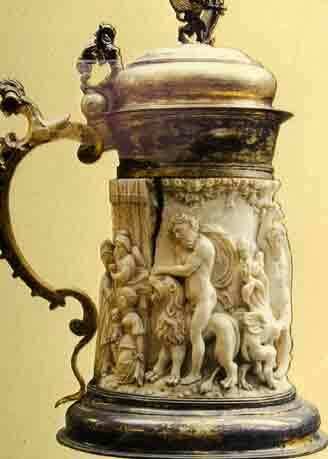 Objects made to be sold can be recognized also by their excessive beauty and rich details, as well as their unusually great size. Judging authenticity on the basis of aesthetic factors is made even more difficult by the fact that venerated statues in Buddhist temples and monasteries, if damaged, were for the most part substituted by copies which were made to look as similar as possible to the original. Detailed information on our site www.MuseoArteScienza.com and in Volume 3 of our Museum�s handbook (pp. 81-97). 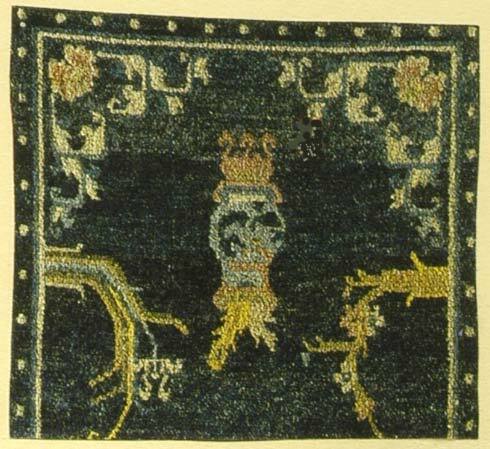 It is relatively easy for an expert to tell whether in all likelihood a carpet is new, old or antique. 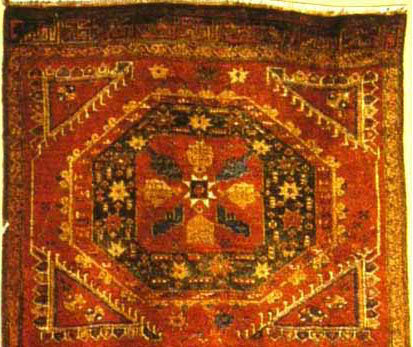 The establishing of exact dates, for really antique objects, is founded however more on sensations or opinions than technical or historical bases, as the raw materials, the dyes, the knotting technique and even the designs have not undergone significant change over the centuries. 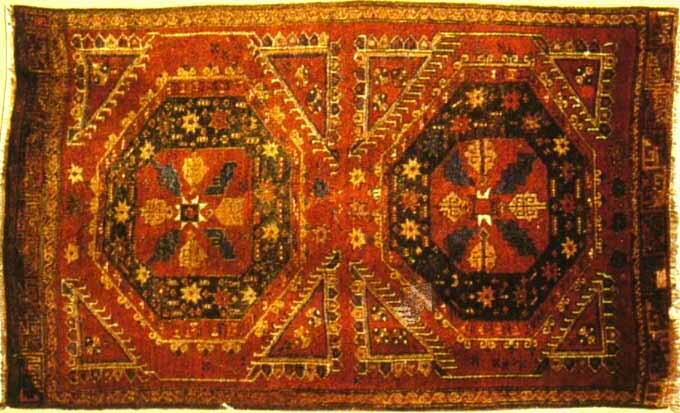 Old Oriental carpets were often the only elements of furnishing, their centre representing the centre of daily life. The most worn areas are therefore in this section. 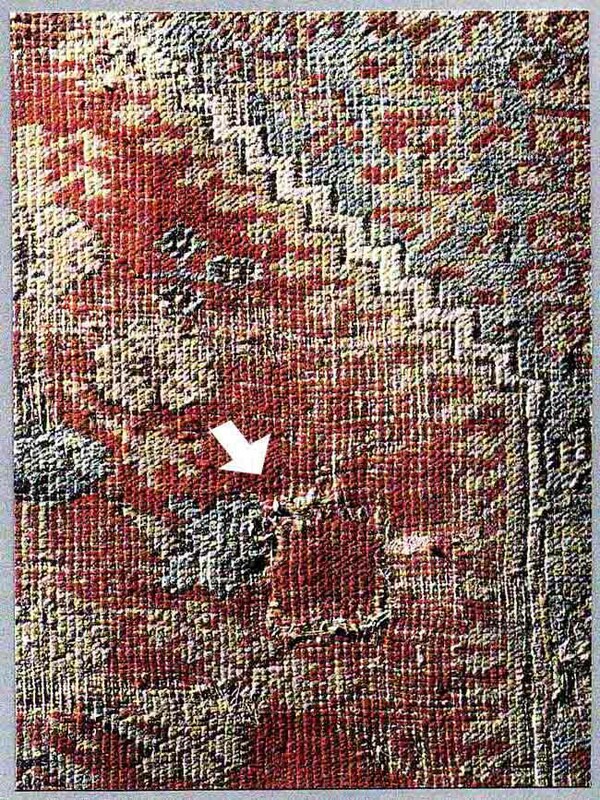 Stylistic and technical comparison with antique carpets of certain dating. Distinction between hand-knotted one-off items and machine-woven industrial products. Examination of the deterioration of the colours. 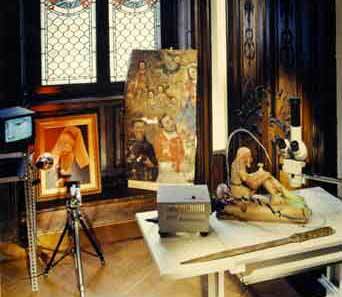 The Museum laboratory�s mission is to improve existing scientific methods and elaborate new methods for the ascertainment of the authenticity of art objects. The laboratory�s instruments and know-how for the determining of authenticity are at the disposal of collectors, art experts, restorers, art galleries and museums. 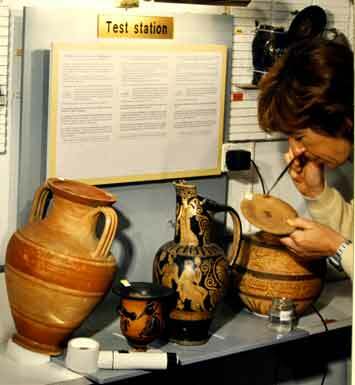 PRICES: the average cost of analyses is Euro 75 per test; some tests are conclusive in telling fake and authentic items apart, such as wood dating and tests on the encrustations on pottery and bronzes. Science has made unbelievable progress in the last hundred years. The number of scientists and researchers active today in every part of the world is greater than the sum of all those who have occupied themselves with science from the origins of mankind to the present day. The possibility of making new discoveries and perfecting existing methods has been greatly enhanced by newly invented measuring instruments and, in particular, by the computer, which permits the rapid processing of data. The art market is increasingly gaining in economic importance and it is only natural that new knowledge is appropriated both by forgers and those who combat them. If all art objects worthy of being imitated were subjected to scientific tests, in the same way as people undergo a check-up of their health, a very high percentage of forgeries could be eliminated in many sectors of the art market and the partly justified mistrust of the same overcome. 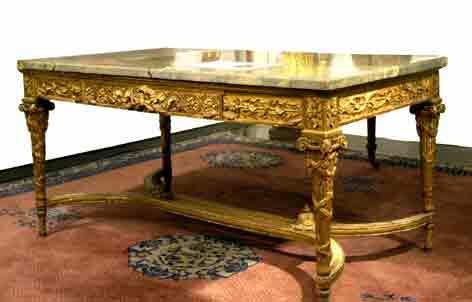 which can be applied in the wide and varied sector of antiques. 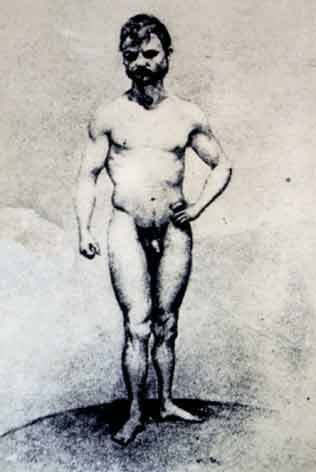 The forger attempts to deceive the naked human eye. But deceiving a magnifying glass in expert hands is practically impossible. 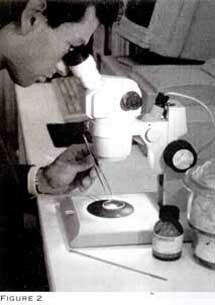 A simple magnifying glass is useful for examining a patina and the surface of an object. For paintings, in particular, it serves to investigate the craquelure, the canvas, the size of pigments and other characteristics of the paint layer and the support. 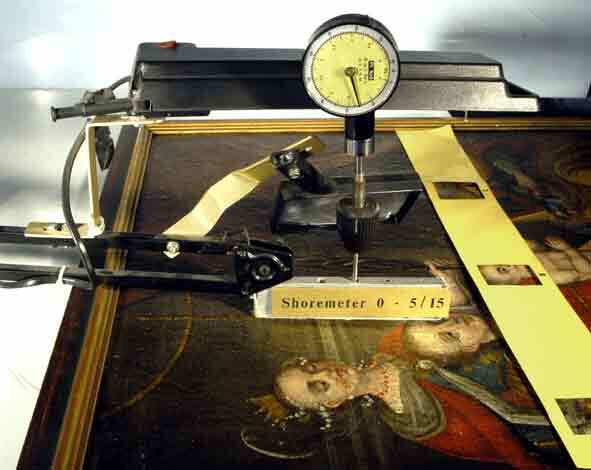 The microscope permits enlargements which enable the structure of the material, like the wood surface, the paint layer with its pigments and many other materials, to be examined. Even nowadays, notwithstanding constant technical and scientific development, we can say that a magnifying glass in the hands of an experienced expert is the simplest and most valid instrument for a preliminary investigation. 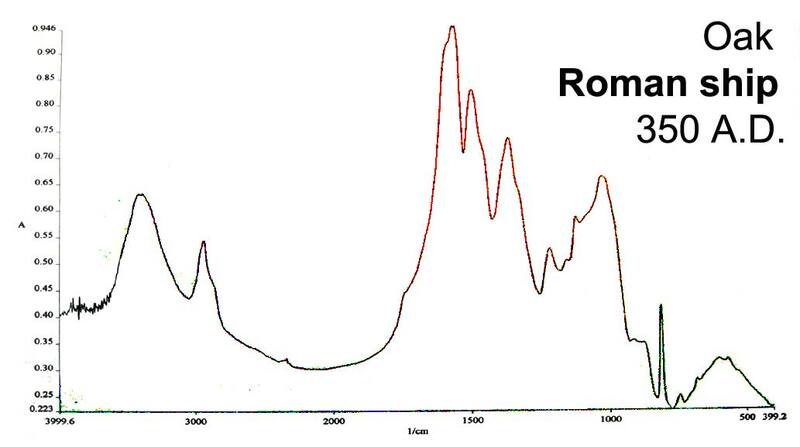 IR spectroscopy has been used for decades in laboratories and industry for chemical analyses. 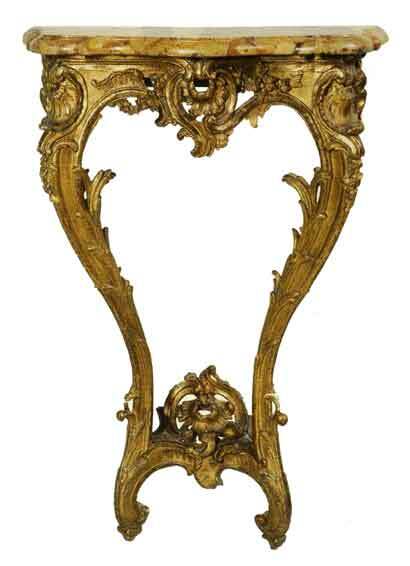 Recently it has started being applied for the dating of wood (Patent G. Matthaes) in the field of art to establish the age of furniture, painted panels, frames, statues, rafters and the like. 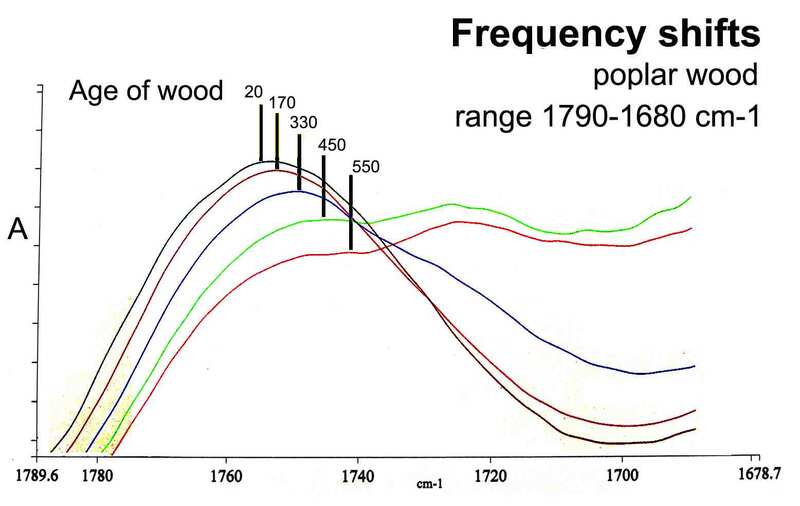 Moreover, the spectroscopic measurement of the age of wood is not influenced by the place of origin of the tree or by the climatic conditions endured by the object over the centuries. The precision of the method presently varies from 10 to 20 years depending on the wood type and its age. A detailed description of this method is presented on the website www.SpectroscopyForArt.com and in the following pages. 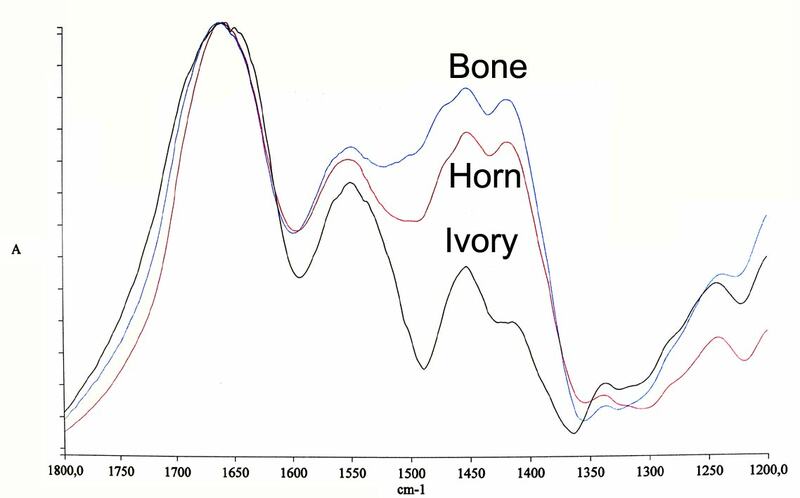 Infrared spectroscopy is not a new method or a new discovery. New is only its application for the ascertainment of age and authenticity in art. 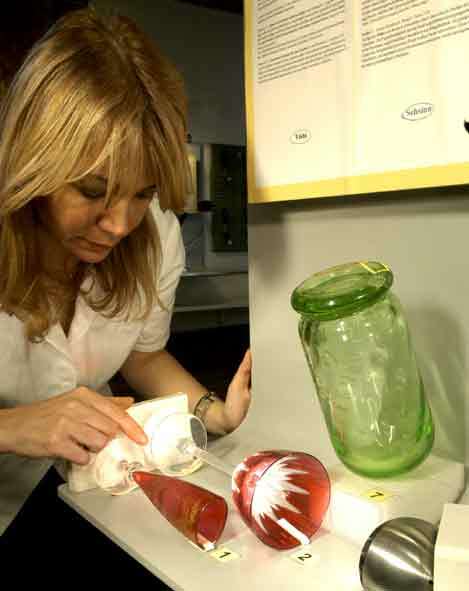 It has been used for decades the world over by all chemical and pharmaceutical companies with thousands of instruments and with the same programme and equipment as the ones used by the laboratory of the Museo d�Arte e Scienza. Its extreme reliability, accuracy and facility of use have made IR Spectroscopy the number one scientific method in all fields where it can be applied. � All the natural materials on earth, including those used for creating art objects, are compounds of specific molecules. � Some particular molecules undergo changes with the passage of time. This dating method therefore permits two possibilities for the evaluation of the spectrum, each one already offering good results singly. 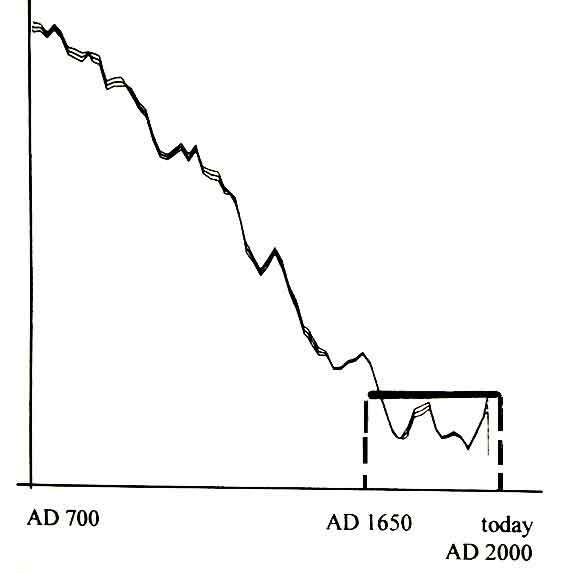 Right from the start of this research, the spectrographic measurement of the angle (α) formed between peaks of different heights permitted a dating accuracy of +/-20% and these findings were communicated at the time, around 1995, to a number of European museums and institutes. 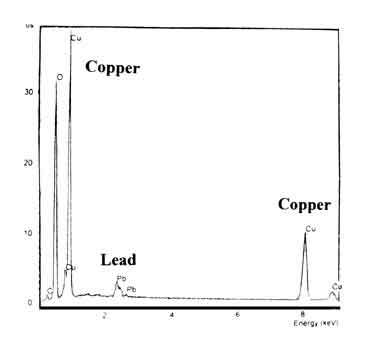 (Figure 3) - The diagram on the right is only one example of the many characteristics of a spectrum. At present we are attempting to trace this accuracy, as well as independence from climatic conditions, to biological programmes inside the cellular nucleus of the tree. The incredible precision of these types of biological programmes in general is well-known and understandable for the growth of wood. An answer to the question why the ageing of wood must also be programmed can be supplied only by the evolution of cellular research. Tree cells, unlike animal cells, are highly protected by a wall of cellulose, a hydrocarbon. Cellulose is extremely resistant to water and wood cells as well as datable wooden material can still be found in excavated Roman ships. 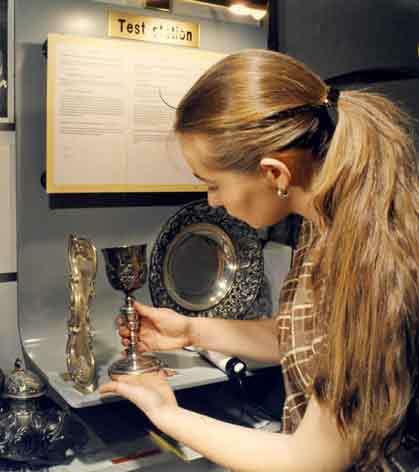 At its appearance, the 14C method was hailed as a prodigious tool for the absolutely certain determination of the age of antique objects and thus a valuable arm in the fight against forgers. This method permits the dating of organic material containing carbon, such as wood, fabrics, hair, ivory, coal, coral, leather, shells, forged iron, paper, etc. In the Earth�s atmosphere natural carbon occurs in three isotopes: 12C, 13C and 14C. Only the last is radioactive and therefore unstable and its decay measurable. 14C is continuously created in the upper atmosphere through the effect of cosmic-ray bombardment and reaches the Earth with the rain. All forms of life, whether plants or animals absorb in the course of their existence, through water, also the 14C isotope which is incorporated in their bodies and therefore also in fibres of wood. At their death, this absorption ceases and the 14C is slowly transformed into 12C. The rate of decay is known to us and has been recorded in detailed tables, variously rectified and corroborated. Diagram 1 shows the curve of this decay period. The creation and concentration of 14C in the atmosphere has undergone considerable fluctuations over the centuries. There are uncertain periods, owing perhaps to the activity of the sun and oscillations in the magnetic field. The development of 14C in the Earth�s atmosphere has been subject to such wide variations that measurement data concerning these periods cannot be interpreted. The uncertain periods unfortunately coincide with two of the most important eras from an artistic point of view: the centuries of the Greek civilization and the last 350 years of our history. The method is therefore not applicable for antiques created after about 1650, which unfortunately comprises the majority of those offered by the market. 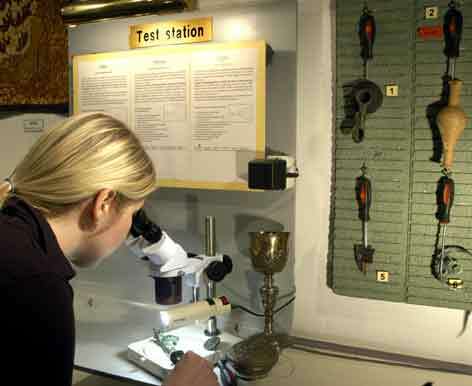 Summing up, we can safely affirm that the 14C method is reliable above all for the examination of archaeological samples, or in any case objects which are very old, and represents a relatively accurate and certain dating method in this field. 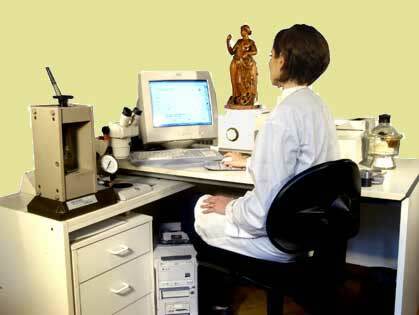 These tests are best carried out in the laboratories of leading universities. They are, however, comparatively expensive. 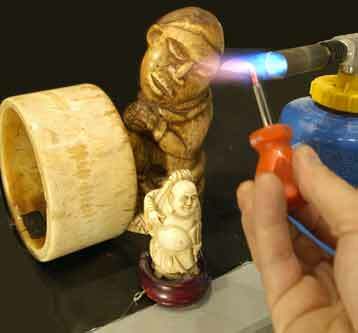 The most important fields of application in antiques are wood and other organic substances like glues, bone, ivory, etc. The counting of growth rings is one of the most accurate methods for the absolute dating of a piece of wood, as long as the exact place of growth of the tree it was taken from is known. Back in school we learnt that the age of a tree can be calculated by counting the rings in its sawn trunk: each ring, consisting of a light area and a dark area, represents a year�s growth. If an old piece of wood is found, for example in a piece of furniture, with a sufficient number of tree rings on it, it should be possible to establish his age by comparison with the table of tree-ring sequences. Theoretically, dendrochronology is the most accurate method for dating wood. In practice, growth rings present many drawbacks. Given that their widths are influenced exclusively by the climate in which the tree grows and climate varies not only between Spain and England, but also between the north, the centre and the south of England, or between a valley or a hill, specific tables must be elaborated for each of these areas. To begin with, therefore, it is necessary to know fairly exactly where the tree grew. A great limitation consists also in the fact that only a few types of trees, like for instance oaks, develop growth rings and that in order to be able to count them it is necessary to have a rather large piece of wood available. Dendrochronology is an exact science for studying the climate of a specific region and dating wooden objects of such provenance. It is a generally accepted opinion that this method is not suitable for reliably dating a single antique object in wood. 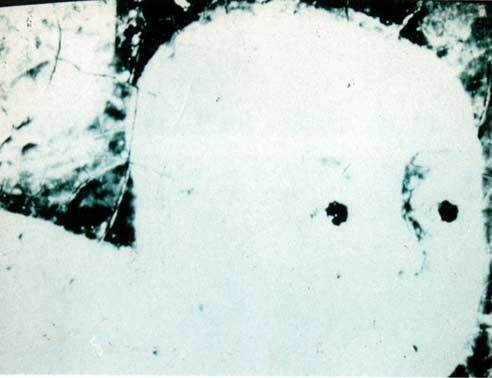 Some doubts have been cast, however, on this very positive feature ever since the discovery of the method, for the following reason: a number of crystals contained in the subsoil are radioactive and the radiation they emit is absorbed by specific crystals, mostly quartz crystals, contained in the terracotta of the buried objects. The amount of radiation absorbed depends mainly on the length of time they lie buried under the earth, and is measurable. Certainty is offered by an examination of the encrustations which generally cover the ceramic surface, a method, used at the naked-eye level, as old as archaeology itself. Today it is possible to carry out this test easily using spectrography, which can distinguish with great reliability between artificially produced encrustations using cement, earth and glue from the authentic mineral salts which have formed over centuries underground. Infrared radiation is characterized by the length of its waves, which penetrate deeply into matter. This phenomenon can be seen at sunset, for instance, when the very long red light waves manage to pass through the dense atmospheric haze filled with dust and smoke, whilst the light of other colours with shorter wavelengths are absorbed. 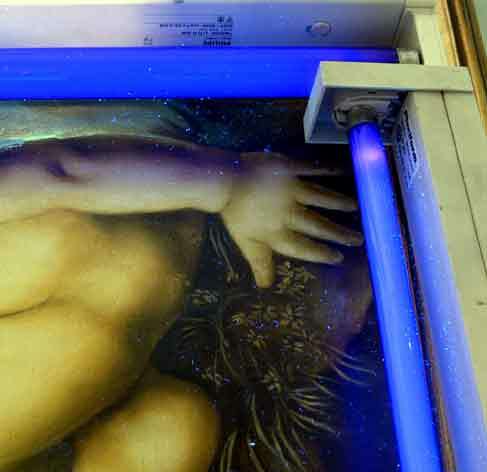 In an oil painting, for instance, infrared rays can penetrate the paint layer and, if this is thin, can reach the white priming. This is the technique applied in modern IR reflectography. 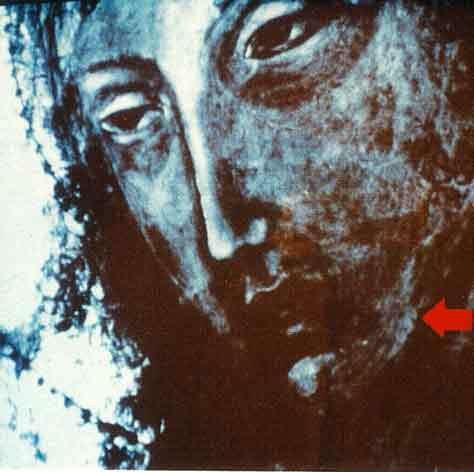 This technique is very important for establishing whether a painting is an original work or a copy. In most cases a professional painter makes a preliminary sketch of the contours of his figures in charcoal or lead pencil on the prepared canvas. 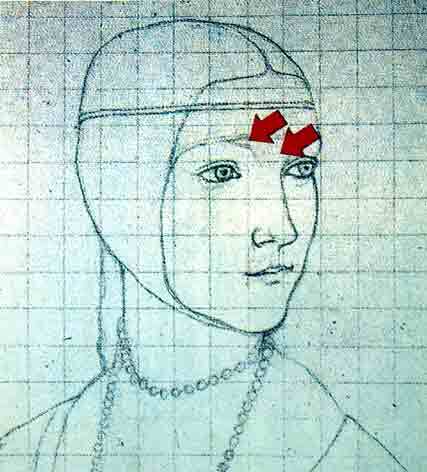 If, for example, a copyist has traced a grid to help him get the proportions of the painting right, the black lines, detected by the camera�s sensor, show up clearly on the screen. 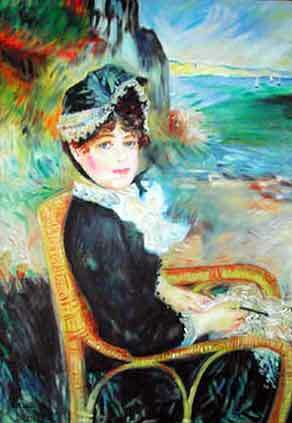 Every painter develops a personal style. An expert is able to recognize an artist�s hand simply by observing a sketch or a drawing. By means of reflectography it is possible to see the sketch that served for the future painting. The penetration of rays permits moreover to examine the craquelure into the depth of the painting layer. The human eye sees only a part of the vast colour palette of light. Physically speaking, colours are electromagnetic waves that oscillate at a given frequency. The colours received by the eye and interpreted by the human brain are limited. They lie at the centre of a vast range of electromagnetic frequencies. In the invisible region of the spectrum, which comprises the long frequencies, we find also infrared (IR) light and in the region of the short wavelengths, ultraviolet light. 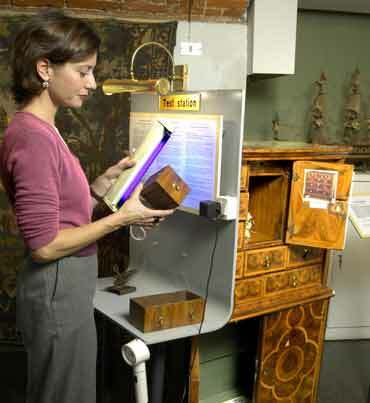 The invisible colours are precious elements for investigating authenticity, as copyists and forgers do not realize that the material they use can betray them thanks to the use of a light they cannot see. Using a camera with special films, all the specific effects produced by IR and UV lamps beyond our field of vision can be captured and then examined in printed photos. The examination of a painting should be done with three types of light: IR, UV and Wood�s, all of which are easily carried out. Sunlight looks white to us because our eyes are used to perceiving the sum of all the frequencies of the colours that the sun emits as white. If, instead, we light any object with rays of a single colour, it loses its beauty and details stand out which had previously escaped the notice of the observer fascinated by the spectacle of its colours. The most commonly used monochromatic light source is sodium vapour, which is pure yellow. 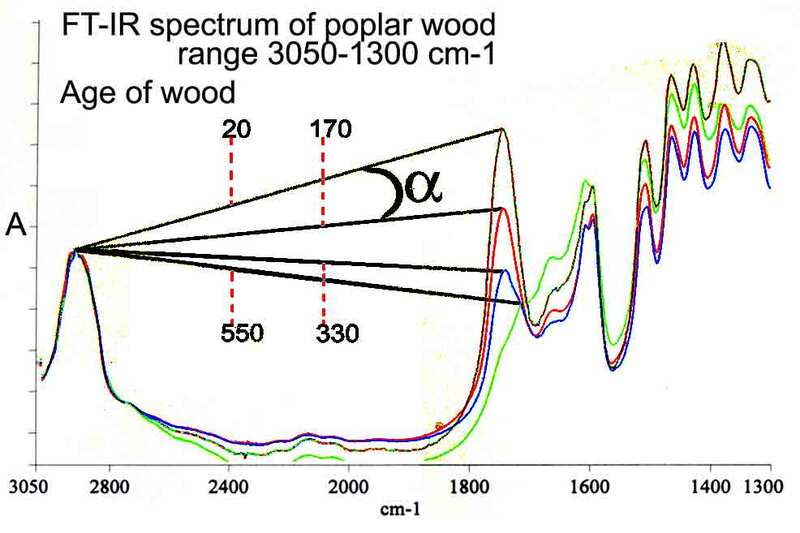 Wood�s light rays differ basically from others in that they excite certain molecules, thereby creating fluorescence. This means that the material not only reflects light but gives off a light of its own. The test with Wood�s light does not only change the colours, but produces new shades of colour. The fluorescence method is a very important research tool. It makes it possible, for example, to tell real pearls from artificial ones and real amber from amber made from synthetic resins, as well as to detect false gemstones and enamelwork, restorations made to furniture, and so on. These rays penetrate through solids and reveal what even the finest experts cannot see. An examination by X-radiography does not generally require specific laboratory equipment. 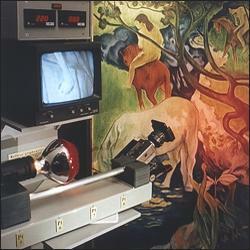 The X-ray machines doctors usually have in their studios are all suitable. What can be detected are changes made either by the painter himself or by the restorer. 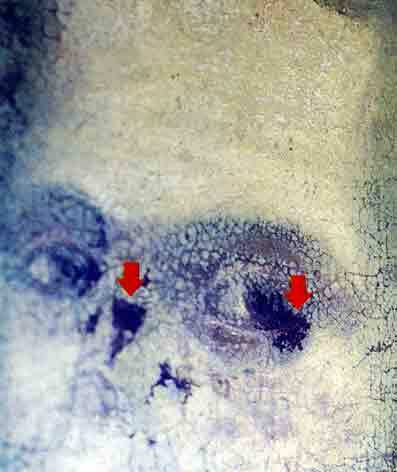 In some cases examinations with X rays permit the discovery of an older painting underneath the visible one. Without the possibility of making broad comparisons, the X-ray of a single painting gives few clues as to the hand of the painter. With the help of a microscope it is possible to distinguish pigments by their colour, their crystalline form, their opacity and their purity. The spectroscopic method allows us to determine with certainty the single molecules of which the pigments are composed. The peaks of the curves signal the presence of copper and oxygen (in the azurite blue pigment) and lead (in the white lead pigment). 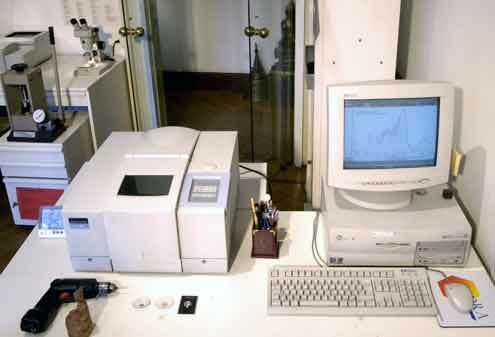 Further techniques for analysing pigments are: X-ray fluorescence analysis, scanning electron microscopes and atom absorption spectrometry. The application of these methods is valid for almost all materials to be found in the antiques trade and permits specific examinations. Fully aware of the many intrinsic difficulties involved, and eager to help lovers of antiques, G. Matthaes has been working for over twenty years on the compilation of a reference work capitalizing on the experience accumulated over the years in over fifty books written by expert restorers and antique dealers in various languages, integrated by continuous updatings and new research carried out by its scientific laboratory. The result of these studies is the "Art Collector's Illustrated Handbook" which, with its clear and persuasive information, concisely presented and richly illustrated, guides the reader as to how to recognize authentic art objects. 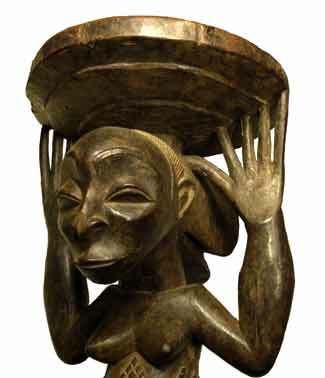 www.AuthenticAfricanBronzesandCeramics.com - Dedicated to the authenticity of African artworks in bronze, stone and pottery. 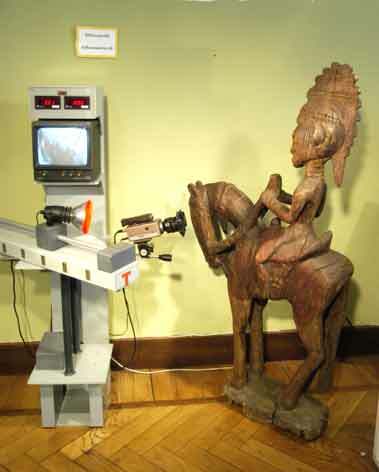 The scientific laboratory of the Museo d�Arte e Scienza has developed valid methods for telling authentic African objects from copies and fakes. 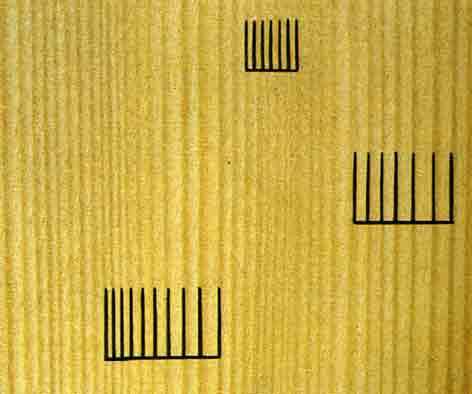 www.SpectroscopyforArt.com - A scientific method for the dating of the wood and identification of the wood type used for art objects. Determination of their authenticity through analysis of colours, binders, pigments and other organic substances. Museo d�Arte e Scienza di Gottfried Matthaes S.R.L.